There's good news and there's bad news. The good news is that respiratory wise Rambo is looking better today. His rate has slowed down, his oxygen requirement is down, and he appears, at least for the moment, to be working less hard. I dare say almost comfortably. His broncho spasms (which were part of the asthma like response) have stopped and today's xray did not seem changed. 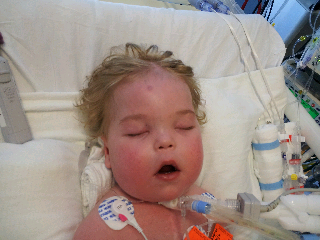 We have finally gotten his breathing to a more manageable place. They got around to the echo yesterday which showed that the pressures in the right side of his heart are higher. This is because of the back up in his lungs. 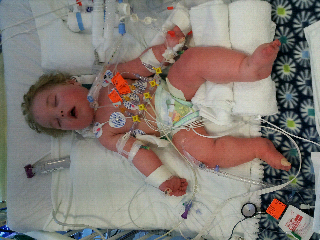 This in turn is causing the unoxygenated blood from the right side to mix with the oxygenated blood on his left side through the residual VSD that he has. Which means that unoxygenated blood is being pumped through his body where oxygenated blood should be. Therefore causing low saturations and part of the need for increased oxygen requirements. Basically the lungs are affecting the heart which in turn is affecting the lungs which affects the heart which affects the lungs and so forth in a viscious cycle. What can they do about it? A few things. 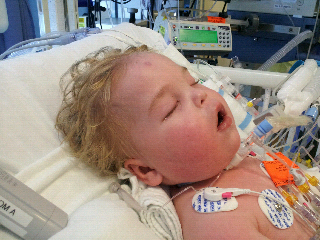 They put him on nitric oxide to help beef up the oxygen already in his system (basically). 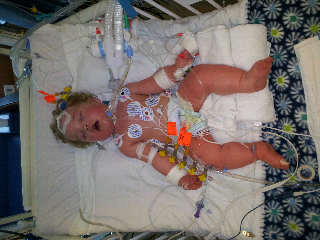 They have started him on milrinone for his blood pressure and they also gave him blood since his hemaglobin was low. (The more red blood cells the better.) This all has helped overnight and like I said before he appears to be responding well. Right now he is getting an ultrasound of all his extremities to look for anymore clots, to see if there is another vein to do an IV in, and to look at his liver because his enzymes have been high. Hematology said they would most likely start heprin to keep the clots from getting larger but they wanted to look at the ultrasound first. His body looks like its on fire. Literally. He is red from head to toe. I'm not sure how well the pictures show it but he is RED. We are not 100% sure of the reason for this but the guess at this point is that his blood pressure medicine is inducing it by dilating the vessels. At this time it does not appear to be causing any trouble but they started benadryl just in case. And I believe that is the last of the bad news. He's had a lot of visitors today; allergy team, infectious disease team, hematology, etc. All are going to proceed with bloodwork of some sort. However, allergy does not think any of this is related. For many reasons which I will not write out because it just doesn't matter. Infectious disease wants him tested for hepatitis and a bunch of other viral things that he probably doesn't have. Its been a busy few days. I got my first good nights sleep in a while last night and I did not want to wake up this morning. Some more good news-Children's House called us to say they have a room for us. Woot! That is all for now. Just remember what ol' Jack Burton does when the earth quakes, and the poison arrows fall from the sky, and the pillars of Heaven shake. Yeah, Jack Burton just looks that big ol' storm right square in the eye and he says, "Give me your best shot, pal. I can take it."